Image: The electron microscope images show bird's-eye-views of the valves that allow water to move upward through conifer trees (upper left) and angiosperms or flowering trees (upper right), while the graphics show cross-sections of water flow through both kinds of valves. Conifers -- including Christmas trees -- have valves with a central "torus" through which water cannot pass, surrounded by a porous "margo" through which water flows easily. Flowering trees have homogenous porous valves through which water flows less efficiently. Credit: Springer Science and Business Media, G.L. Comstock, W.A. Cote and E. Wheeler. Conifers such as Christmas trees suffer a severe plumbing problem. The "pipes" that carry water through firs, pines and other conifers are 10 times shorter than those in flowering trees. But a University of Utah study suggests why conifers not only survive but thrive: efficient microscopic valves let water flow through conifers about as easily as it flows through other trees. "When you are sitting around and admiring your Christmas tree, consider that it owes its existence in part to this clever microscopic valve," says John Sperry, a University of Utah biology professor who led the research team. "Without these valves, conifers could be much less common than they are, and conceivably their survival might be marginal." The journal Science is publishing the study Dec. 23, two days before Christmas. Sperry says that if conifers had not evolved easy-flow valves to make up for the short length of their water pipes or conduits, "it is doubtful they could hold their own with angiosperms [flowering trees] in today's forests. It's doubtful they would dominate whole regions of North America." While scientists cannot really know if conifers might have gone extinct without their efficient type of water valve, "what this study shows is that without this valve, it would be 38 times harder for conifers to take up water, which would put them at a serious disadvantage in competition with flowering trees in temperate forests," says Sperry. The study was part of a University of Utah doctoral thesis by Jarmila Pitterman, now a postdoctoral fellow at the University of California, Berkeley. She and Sperry conducted the study with other University of Utah biologists: Uwe Hacke, a research assistant professor; lab technician James Wheeler, who has since left for graduate school at Harvard University; and Elzard Sikkema, an undergraduate. The numerous parallel "pipes" that carry water upward through the woody trunks of evergreen coniferous trees are single-celled conduits called "tracheids" and are only a few millimeters long (about one eighth of an inch). In flowering trees, the pipes are multicellular conduits called vessels and are 10 times longer, or a few centimeters long (more than one inch). As a result, water moving up through an evergreen must pass through 10 times as many valves (known technically as "pits") as water moving up through the trunk of other trees. Sperry said that should be a severe handicap for conifers in competing against flowering trees for water. Yet conifers thrive, and they dominate forests in many regions of Earth. Hacke says the planet's tallest trees are conifers: redwoods and sequoias. So are the oldest trees, bristlecone pines. So how did conifers overcome the handicap of short pipes? Scientists already knew that the valves between water pipes or conduits are far different in conifers than in angiosperms, or flowering trees, but they did not know how that difference affected water flow. In the new study, the biologists measured water flow through twigs from 18 species of conifers and 29 species of angiosperms. Conifers studied included Douglas fir, subalpine fir, white fir, lodgepole pine, various spruces, Utah juniper, Rocky Mountain juniper, redwoods, bald cypress and conifers known as podocarps and araucarias from New Zealand and New Caledonia. Angiosperms included oaks, willows, ash, various maples, hickory, mulberry, creosote bushes, manzanita, serviceberry, mountain mahogany, grapevine and others. The researchers connected both ends of each twig to plastic tubing, used an elevated reservoir's gravity to force water into one end of each twig, and then used an electronic balance to weigh water dripping out the other end. Then, based on the number of conduits and valves in twigs and their known dimensions, the biologists calculated the resistance to water flow of both the conduits and the valves. The scientists found that for conduits of the same diameter, resistance to water flow in conifers was only 1.2 times greater than in flowering trees – essentially the same. Sperry calls that "remarkable." And water flow actually was better in conifers than in flowering trees in terms of resistance to flow per unit area of wood. The pits or valves that connect the water conduits in trees not only carry water up trees from the roots, but also prevent air from entering the conduits and killing trees. Sperry says the range of conduit diameters vary but overlap for conifers and flowering trees. The conduits or tracheids in conifers range from 10 to 50 microns (millionths of a meter) in diameter, while the conduits or vessels in flowering trees range from 15 to 110 microns. The valves are in "end walls" at both ends of water conduits. In conifers, there are about 25 to 50 valves at each end of a conduit; in flowering trees there are many more. These valves are disk-shaped membranes. In flowering trees, the membranes are homogenous, with water seeping through microscopic pores. 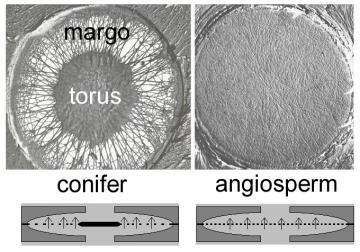 But in conifers, the valve membranes have what is known as "torus-margo" structure that resembles a bird's-eye-view of a circular trampoline. "It's like a trampoline in that the torus is the mat, and the margo represents the supporting springs with holes between them," Sperry says. "The margo holds the torus in place just like springs hold the trampoline in place." Water cannot pass through the central torus, but easily flows through the margo pores, which are about 100 times larger than the pore in flowering tree valves – on the scale of one 10-millionth of a meter versus one billionth of a meter. The bottom line is that conifers have shorter conduits and fewer valves, both of which would increase resistance to water flow, "but they compensate for that because each individual valve is so much more efficient," Sperry says. "The flow resistance through a valve of a given size is 59 times lower in a Christmas tree than in an oak tree." Flowering trees have longer, more efficient conduits, but less efficient valves. Sperry says conifers and flowering trees evolved with "two solutions to the same problem." Conifers, which arose more than 280 million years ago, have primitive conduits that are short and inefficient and evolved in some of the oldest plants some 400 million years ago. The highly efficient, torus-margo valves evolved in conifers and their relatives no later than 220 million years ago, Sperry says. Flowering plants evolved at least 146 million years ago and retained inefficient valves that first appeared some 400 million years ago in ferns, cycads and other primitive plants. But flowering plants evolved longer conduits to get around the problem. "The evolution of the specialized valve and the specialized conduit are both ways of achieving more efficient water transport within a tree," for conifers and flowering trees, respectively, Sperry says. He says that as angiosperms evolved and competed with conifers for water, "it is quite possible that if conifers hadn't evolved this efficient valve, they wouldn't have been as conspicuous an element of today's forests. Being at such a tremendous disadvantage in the competition for water, it is unlikely they would be such a dominant element in modern forests."